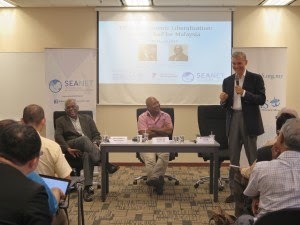 Last Saturday, the Institute for Democracy and Economic Affairs (IDEAS) and the South East Asia Network for Development (SEANET) co-sponsored a debate in Kuala Lumpur. 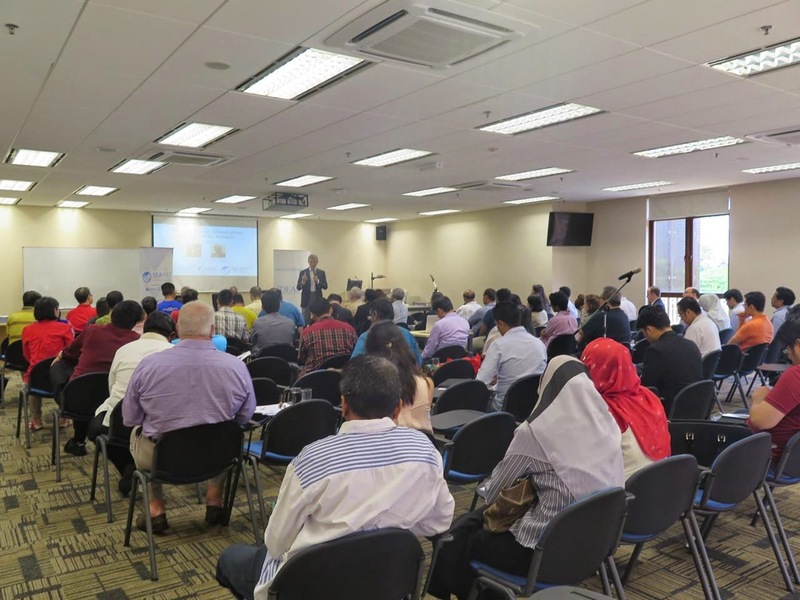 IDEAS and the Southeast Asia Network for Development (SEANET) organised a public debate on the TPPA and Economic Liberalisation on Saturday, 28 March 2015. The TPPA, Trans-Pacific Partnership Agreement, is a free trade agreement that Malaysia is currently negotiating with eleven countries including the United States of America, Mexico, Chile, Brunei Darussalam, Singapore, Vietnam, Japan. 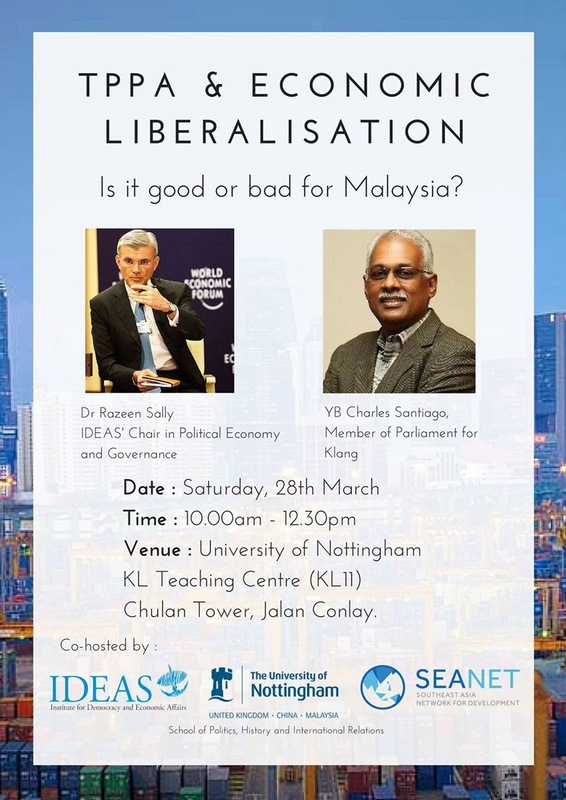 The debate featured Dr Razeen Sally, IDEAS Chair in Political Economy and Governance, who argued for positive impacts of the trade agreement and YB Charles Santiago, Member of Parliament from Klang, who argued the opposite. Sharaad Kuttan of BFM moderated the debate. The impact of trade agreement on the provision of health care including the price of medicine and state’s sovereignty and ability to protect its interest against companies is among topics that were hotly debated on the forum. YB Charles Santiago who argued against the TPPA maintained his position that the trade agreement will impact negatively on the price of medicine and the ability of the state to protect itself against corporation. He mentioned cases of dispute between a tobacco company and Australian government. Dr Sally on the other hand, while having reservation on some parts of TPP, argued that the trade agreement can help in inculcating domestic culture of good governance through competition. 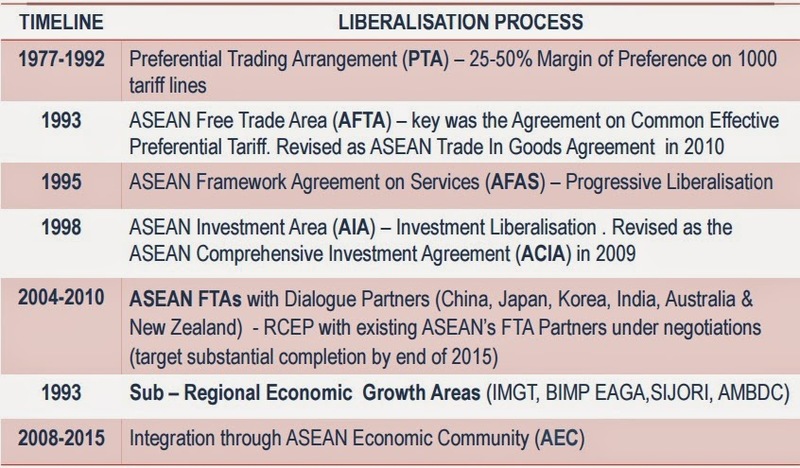 Coupled with domestic liberalisation and reform, the TPP can make Malaysia become more economically competitive. On the impact of trade agreement on state sovereignty, he argued that instead of assault to sovereignty, trade agreements are way for countries to mutually agree to improve their economies and trade. Cases of dispute between some countries with companies should not be used to make general points. On concerns on the price of medicine, Dr Sally said that some of the problems in medicine prices are related to domestic issues. While the speakers differed in their evaluation of TPPA benefits, both were concerned about the dismal state of Malaysia’s judiciary. The questions posed by the audience touched not only technical issues of the agreement, but also touched on some philosophical questions such as who is more tyrannical: government or company? In addition to posing questions to the speakers, the audience also participated in the debate through casting their votes on whether the TPPA and Economic Liberalisation is good or bad for Malaysia. The initial votes before the debate resulted in 53% votes for good, 19% for bad, and 28% are unsure. The second round of voting, after the debate, resulted in 68% voted Good, 26% voted bad and the remaining 6% voted unsure. Around 80 people attended the debate. Among them are prominent individuals such as Tan Sri Yong Poh Kon, Former President or Federation of Malaysian Manufacturers, Dato’ Satinah Syed Salleh, Former Director of Private Education Division at the Ministry of Education and Dato’ R. Thillainathan, Former CEO of Genting Berhad. A friend, Prof. Bong Mendoza, posted this news report last January 30, 2015. The reporters, Rina Chandran and Sharon Chen, were at the Ayala-UPSE forum at Intercon Hotel in Makati last January. I was there too. It was NEDA Sec. Arsi Balisacan who said "no longer sick man of Asia", not the reporters, not their editor/s. The article makes sense. The sections on consumption boom and population boom, it's true. Our big, young population is an asset, not a liability. More population means more producers and consumers, more entrepreneurs and workers. 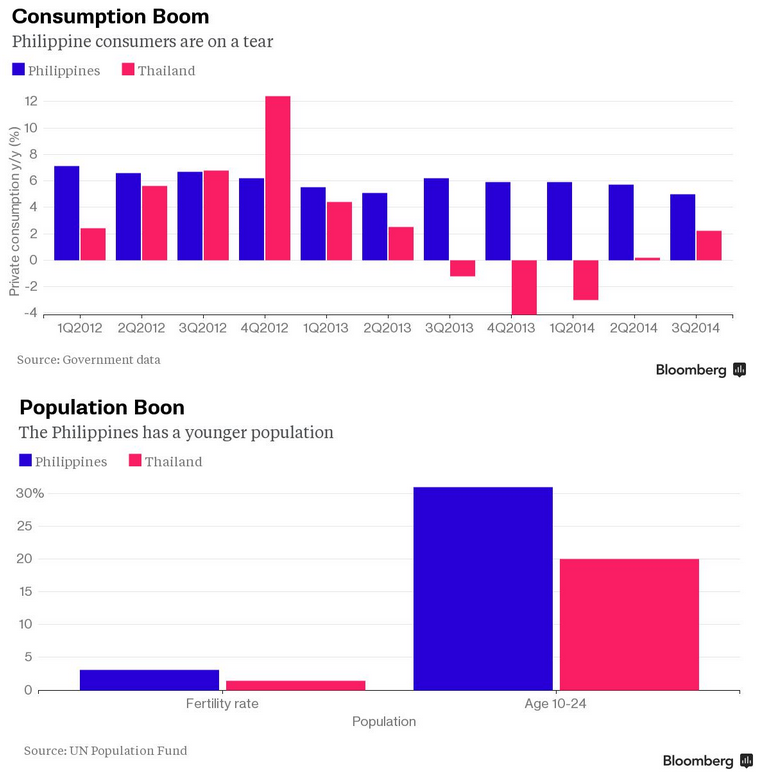 Thailand -- and Japan, S. Korea, HK, Singapore, Taiwan, China -- they are ageing. In many parts of Japan for instance, the sale of adult diapers is larger than the sale of baby diapers. Their public spending for healthcare and pensions will jump to the roof, or the sky, while the number of their young workers who will pay taxes and pension contribution will remain flat, if not declining. BIG problem for them, but not for the PH. Bong also posted the latest WEF's Global Competitiveness Report, 2014-2015. Thanks Bong. 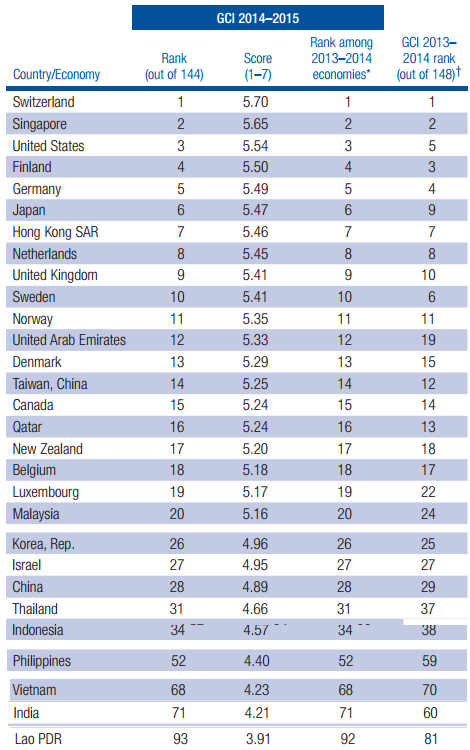 Check the summary table, Table 3: The Global Competitiveness Index (GCI) 2014–2015 rankings and 2013–2014 comparisons. 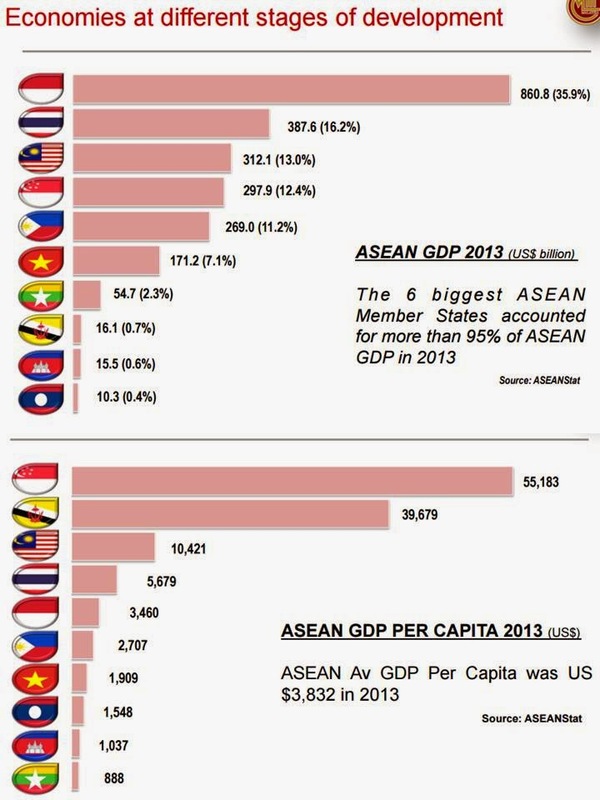 It Is true that Thailand has higher GCI rank than the PH. But there are many indicators of global competitiveness. Our Constitution alone would quickly put down out competitiveness -- foreign competition and investment in many sectors is banned, or restricted to 40 percent maximum. In Thailand and other Asian economies including socialist Vietnam and China, foreign investors and competitors are allowed up to 100 percent equity in many sectors. Some people hate to see and read the above Bloomberg and similar reports. They think there should be no good news in the PH. What we should read only are dirt, pollution, heavy traffic, trains breaking down, corruption, crimes, etc. Wala or konti lang dapat good news sa atin. Negative news lang dapat. Maybe it makes them feel good about themselves. Kaya dapat Ipagbawal ang GDP growth. To celebrate darkness even for one hour is lousy. More, stable electricity at lower price gave us modern life, including the convenience of the web, blogger, facebook and youtube. 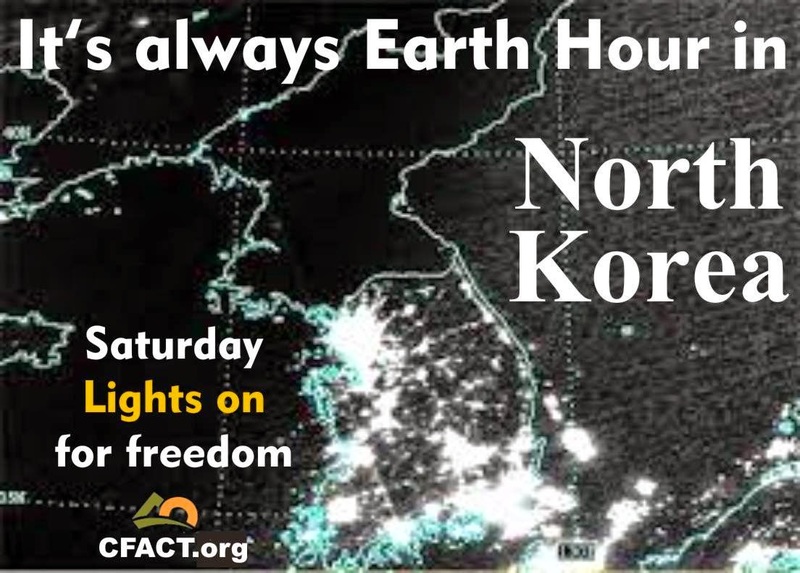 The World Wildlife Fund (WWF), instigator of "celebrate darkness", "use less energy and electricity" movement, along with the UN and Greenpeace, should give special awards to North Korea. The WWF says "change climate change". Huhhh? Climate change is natural and cyclical. Like day-night cycle, dry-wet season cycle, winter-spring-summer-fall cycle, water evaporation-condensation cycle, etc. They want to change that natural cycle? 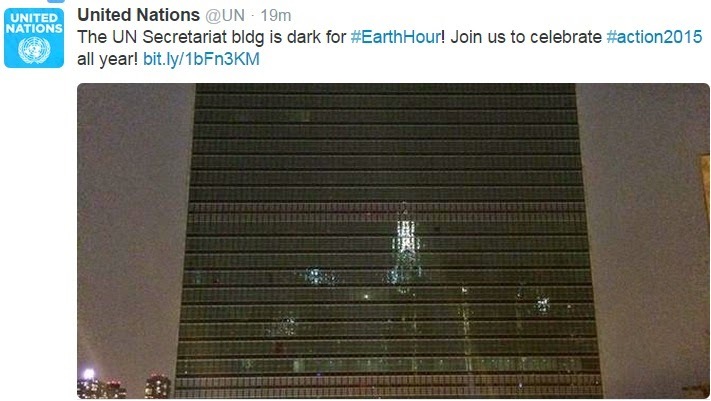 The WWF, the UN and GP, the triumvirate for climate alarmism, should have offices in Pyongyang. It's heaven on earth there, they have little electricity, few power plants from non-renewables, and they use less energy. The UN says we should send them more money, so they can have more and endless climate junkets. As the UN and other climate alarmists cause more alarm and public scare, they get more funding, private and taxpayers money. Then use the money to scare and deceive the public more. 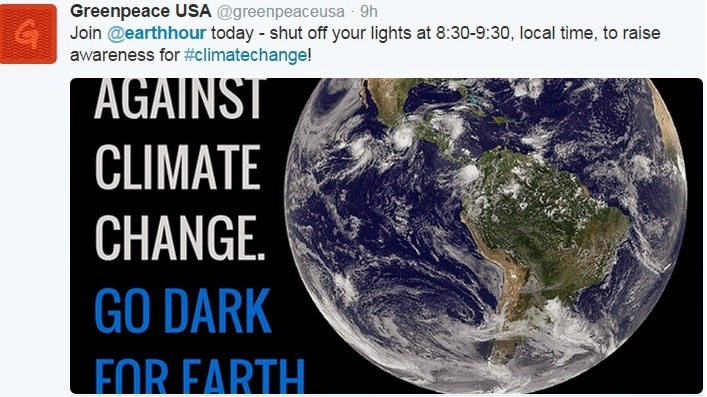 Greenpeace US says more lights and electricity creates "man-made" CC. Thus, the solution is to go dark, wow. The offices, the houses of officers and staff of WWF, UN and GP should go dark every night, 365 nights a year and not just one hour a year. That way, they can help save the planet and walk their talk. Ok, what is the inconvenient truth in climate science? I am posting just four papers from four scientists from four different sources. 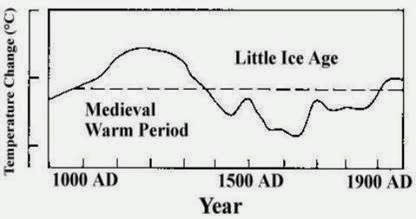 (1) From Dr. Tim Ball, Relative Homogeneity of the Medieval Warm Period (MWP)and The Little Ice Age (LIA), WUWT, March 22, 2015. 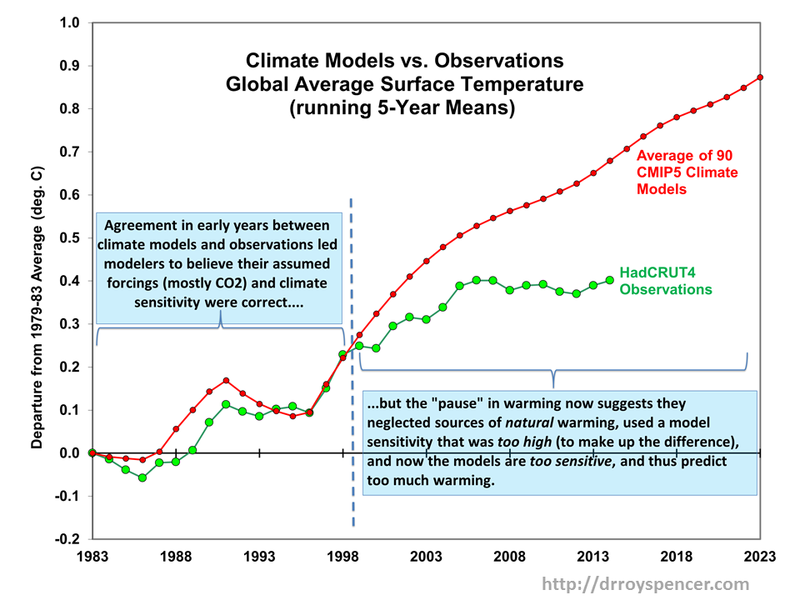 (2) From Dr. Roy Spencer, On Natural Climate Variability and Climate Models, February 27th, 2015. Global average surface temperature changes (as James Hansen has also stated), can only be due to 3 processes: (1) radiative forcing, (2) radiative feedback, and (3) changes in ocean vertical circulation, all of which can be addressed with a 1D model like ours. (3) From Dr. Murry Salby, Man-made CO2 could only cause warming of 'a few tenths ofa degree, if at all', Hockey Schtick, March 24, 2015. Fig. 1: History of change of the total global CO2 concentration per year (green) and only on the surface properties (temperature + humidity dominant parts) induced change in CO2 concentration (blue). Correlation coefficient of 0.93. In contrast to the natural CO2 emissions depend on the "surface properties", do not have the anthropogenic emissions. ...The man-made share of CO2 in the atmosphere is only a maximum of 30% (0-30%). The remainder is related to temperature changes, natural outgassing from the oceans, and to humidity. The residence time of CO2 in the atmosphere is only 4-7 years, not hundreds of years as falsely claimed by the IPCC Bern model. Figure 1: Solar activity of the current Cycle No. 24 in red, the mean value for all previously observed cycles is shown in blue, and the up to now similar Cycle No. 1 in black. Enjoy 6 other beautiful charts here. Here in the Philippines, I think more people now realize that glorifying darkness, even for one hour, is a stupid act. Hence, few people turned off their lights last night. If people think having darkness is a good act, then they should have earth hour every night, 365 hours a year, not just one hour a year. If someone already knows that atmospheric CO2 is readily convertible to carbonic acid in water (H2CO3) which converts to Bicarbonate (HCO3-) which converts to either Sodium Bicarbonate or the Carbonate ion (CO3-2) which ends up as Calcium Carbonate (CaCO3), also known as seashells, skeleton bones, coral reefs, chalk, and limestone, one would also know how quickly such a CO2 increase would quickly be absorbed by the environment. But since very few so-called "environmentalists" actually know science, it's very easy to make them panic. Boo! Finally, here's a better celebration. More lights at night mean less road accidents, less crimes, less strained eyes by students and workers. The campaigners of "darkness to save the planet" do not realize the dangers to humanity of their advocacy. Or they realize it but they do not care. What is important for them is the advancement of their ecological central planning advocacy. When government, local or national, issues a prohibition, normally there are clear signs. Thus, No Parking, No Left Turn, No U-Turn, One way, and so on. Thus, prohibitions against pedestrian crossing should also have clear signs. 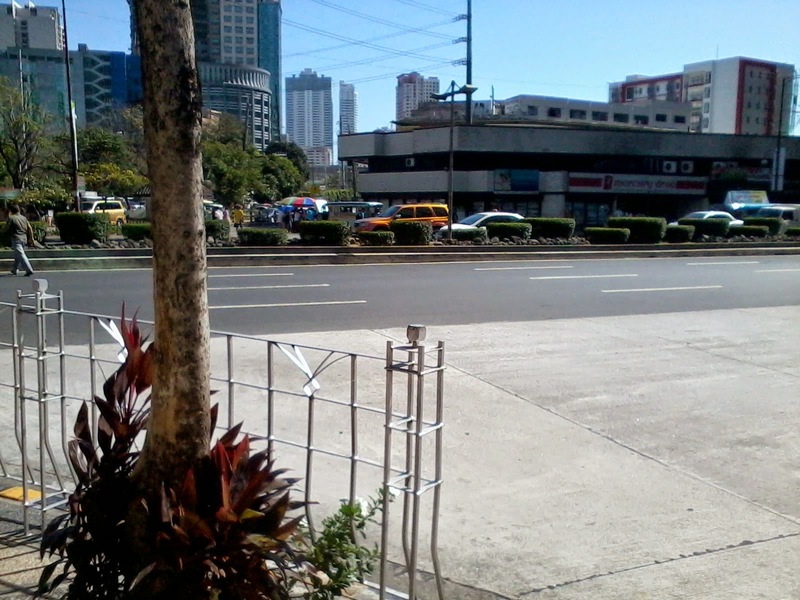 In this part of Buendia, Makati City, in front of Skyland Plaza and Axa building, and Mercury drugstore on the other side, there is not a single "No Pedestrian Crossing" sign. Photo taken June 17, 2014. This photo taken March 03, 2015. There used to be a small sign there, then it became dilapidated until someone took it away. 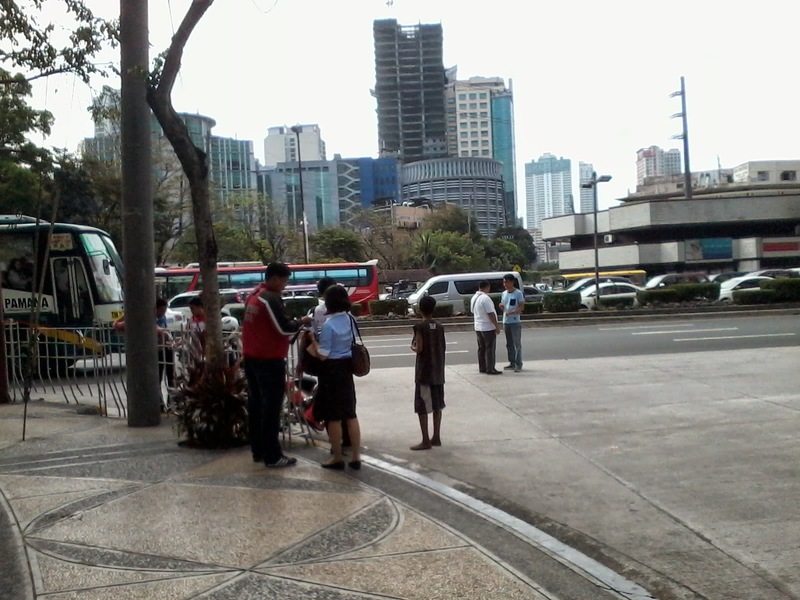 Some Makati City Hall personnel penalize people for crossing this part of Buendia. Their usual reason is, "Bakit, may nakalagay ba dyan na pwede tumawid?" (Is there any sign that people can cross it?). So this is a new interpretation of prohibitions. Before, there are clear signs that certain acts are prohibited; now, absence of clear signs also means that certain acts are prohibited. 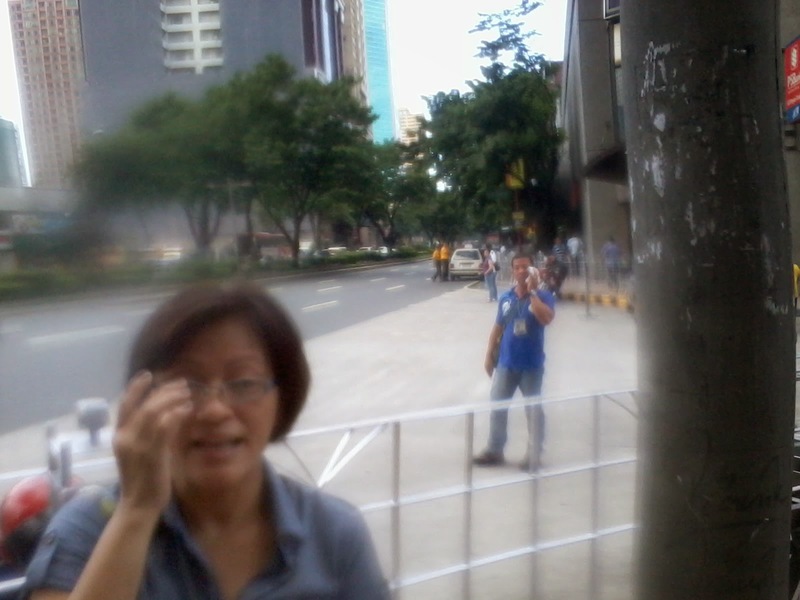 Two of the city hall personnel who were stationed in the area at that time. Some have IDs but their names and photos in the ID are not so clear. Photo taken September 24, 2014. 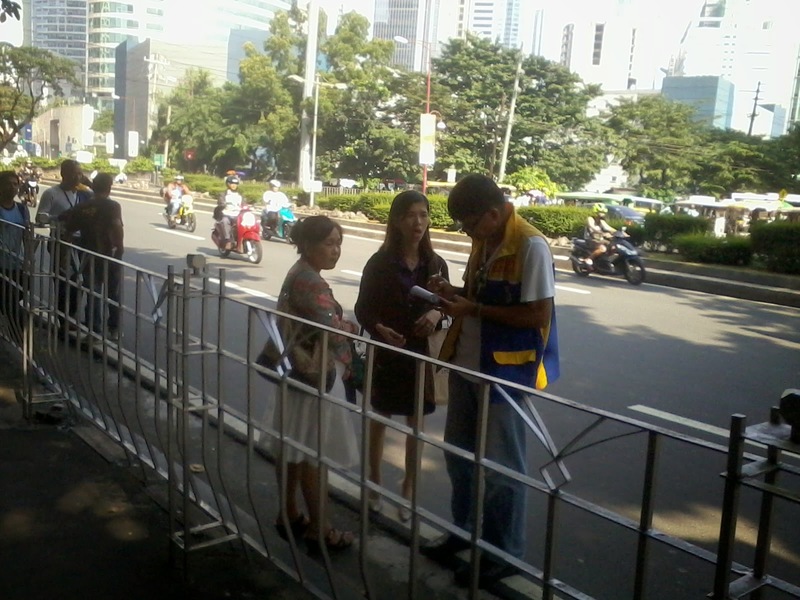 Some days they wear that yellow vest with mark "Binay (or Makati) Action Center". I have heard a number of complaints, usually people from provinces or from other cities in Metro Manila, not familiar with these prohibitions despite absence of clear No Pedestrian Crossing signs. I think the penalty now is P250. This area is busy as there are many offices with their respective clients in both Axa and Skyland buildings. 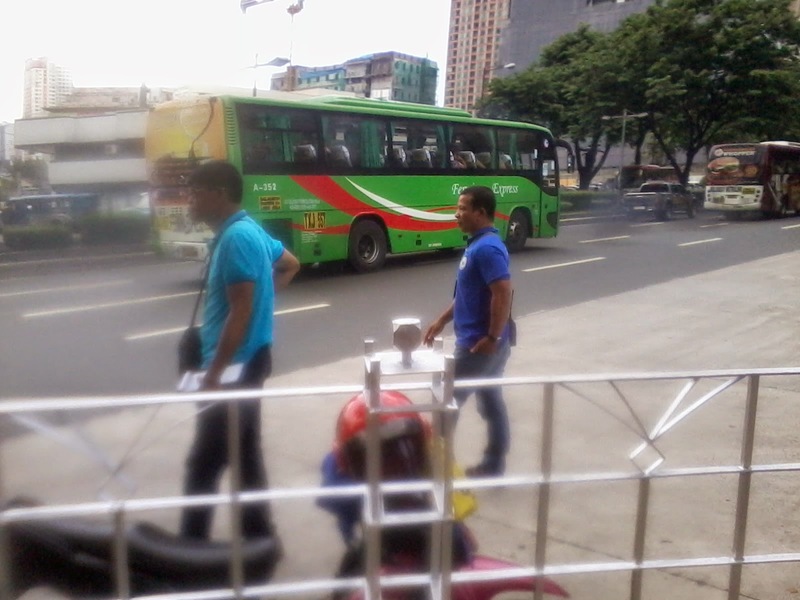 There is only one loading station for buses and jeepneys, in front of Mercury drugstore. 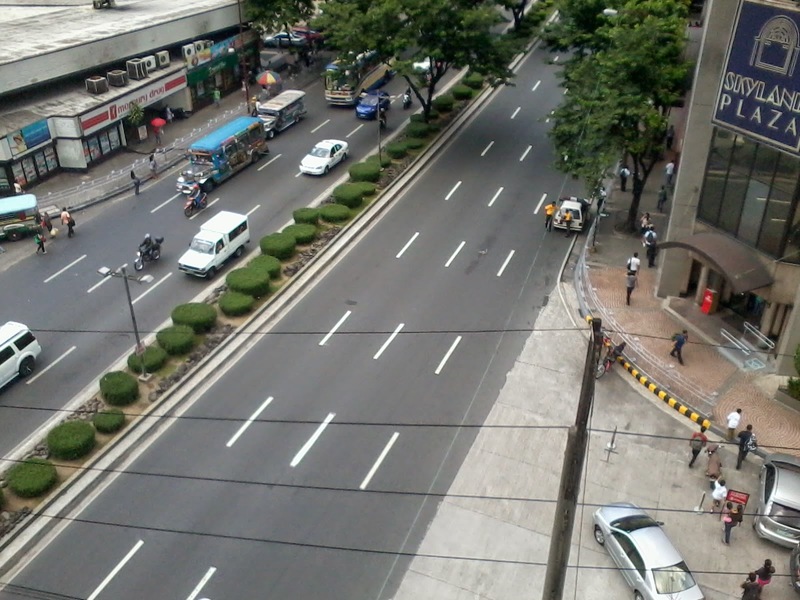 If one must take the bus or jeep, one must walk about 150 meters to the left, at the Ayala-Buendia intersection, cross the street, then walk again about 150 meters. It is rather difficult if one is carrying something heavy, or if one is not feeling well. One time, I came from the DFA and I was carrrying my 4 years old daughter as we have no helper at that time. I got off from the bus at Mercury and wanted to cross the street as it was hot, around 11am and difficult to walk several hundred meters carrying a child. I signaled one city hall personnel if he will allow me to cross as he could see I was carrying my daughter. But he arrogantly told me to take the long route. Just one proof that these people are not real public servants, only for public apprehensions and fine collections. Sometimes they just wear civilian clothes or other jackets. This photo taken February 25, 2015. Photo taken yesterday, March 25, 2015. This Makati City Council order or resolution is not sensitive to ordinary people. City Hall just wants more money from the public. 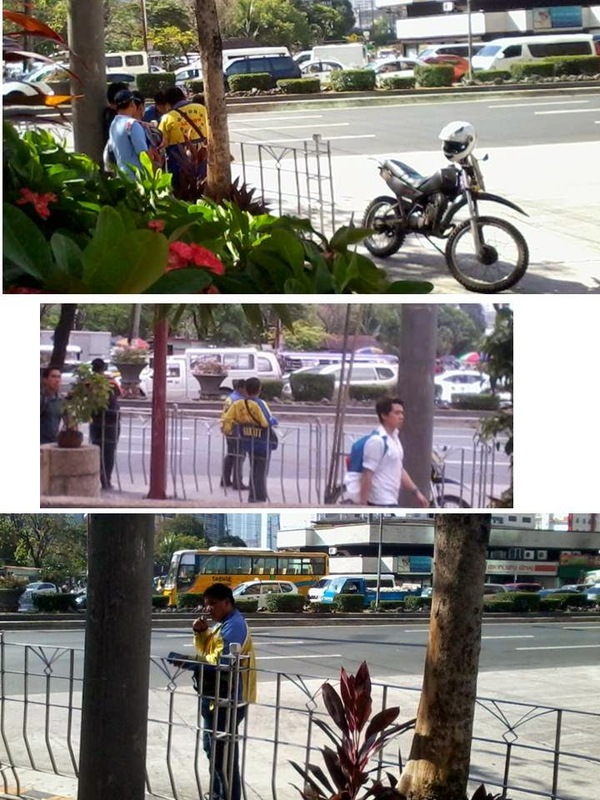 If the city government's real purpose is public service, then it should put personnel there who will assist pedestrians to cross safely, not personnel who will apprehend and penalize people randomly. Since the government encourages people to "leave your cars, commute and do car-ppoling", then people will be crossing roads and streets more often to get to their destinations, or to catch another ride. Of course this practice is not a monopoly of Makati city government; it is also being done by other cities in Metro Manila and by MMDA But practices like this create more disappointment if not public anger at certain local governments and their officials. One more proof that as government (local or national) expands, irrationality also expands. As the Philippine government becomes more fiscally irresponsible and tax-hungry as it cannot raise existing taxes easily without getting new political backlash, it turns its eyes on certain tax holidays and other fiscal incentives that it deems to be "depriving" the government of more revenues. Yesterday, I co-facilitated a small group discussion at the UP School of Economics, organized by my former student org, Economics Towards Consciousness (UP ETC). Before asking my co-facilitator, Prof. Amado "Bong" Mendoza of the UP Political Science Department to speak, I gave this brief intro about ASEAN taxation and tax competition. Data from KPMG, WB and Price Waterhouse (PWC). 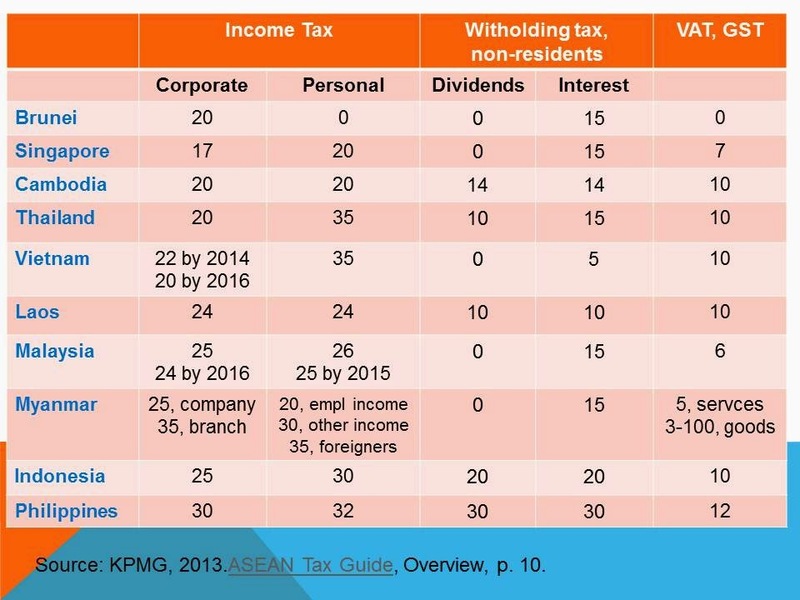 Below, the PH has the highest corporate income tax, highest withholding tax, and highest VAT or GST, also among the highest personal income tax, in the 10-countries ASEAN. 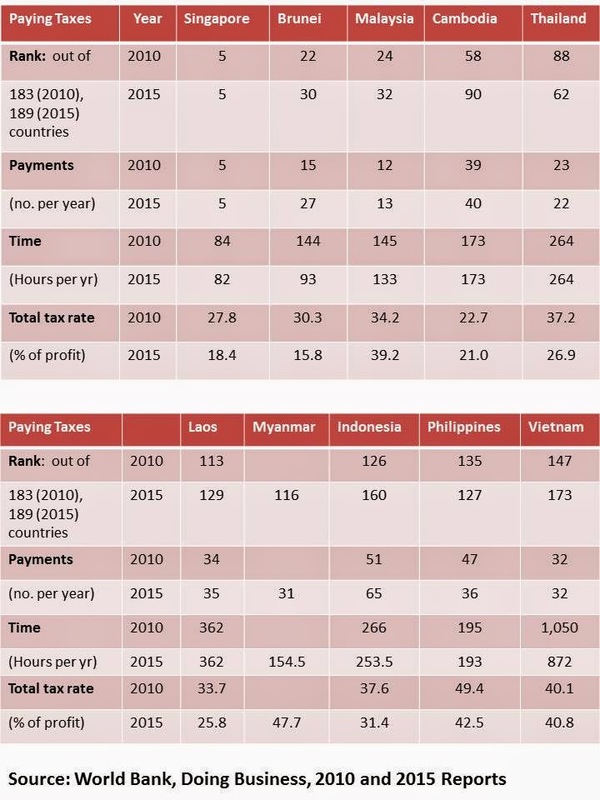 The PH also has the second most bureaucratic tax system in the ASEAN, next to Vietnam. 1. 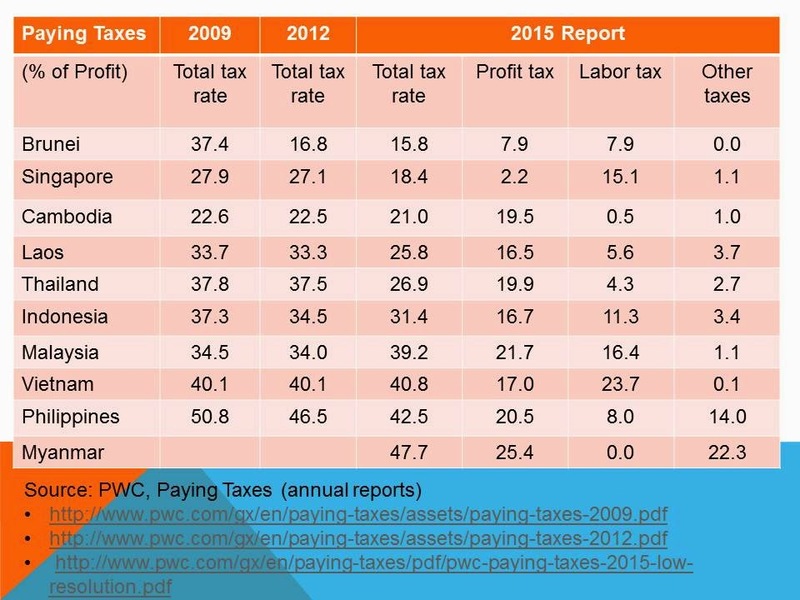 Tax wise, the PH is NOT an attractive place to do business in the ASEAN. High and multiple taxes, complicated and bureaucratic procedures. Neighboring countries except Vietnam offer less complicated, lower taxes. 2. Tax competition among ASEAN member countries is happening, they are cutting their tax burden, except in Malaysia. PH tax burden and cost is declining too, but not low enough compared to many of its neighbors in the region. And those were among the reasons why various fiscal incentives were introduced in the PH, to help attract more investors given the non-attractive overall tax regime. 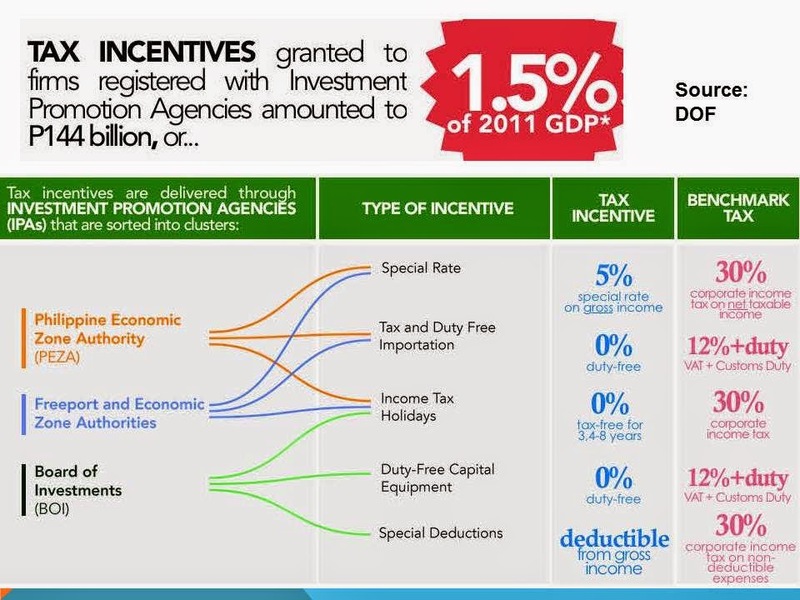 PH Fiscal Incentives Rationalization bills in Congress, mainly pushed by the Department of Finance (DOF). 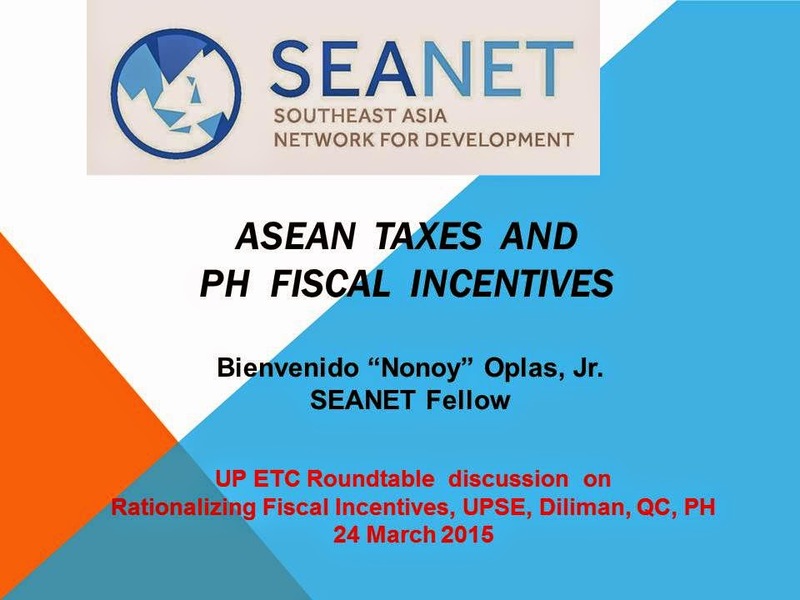 They argue that it is necessary to reduce or remove some of those incentives, raise more tax revenues to finance the annual deficit, build more infrastructures to prepare for AEC and regional integration, amortize new and old public debt, and so on. 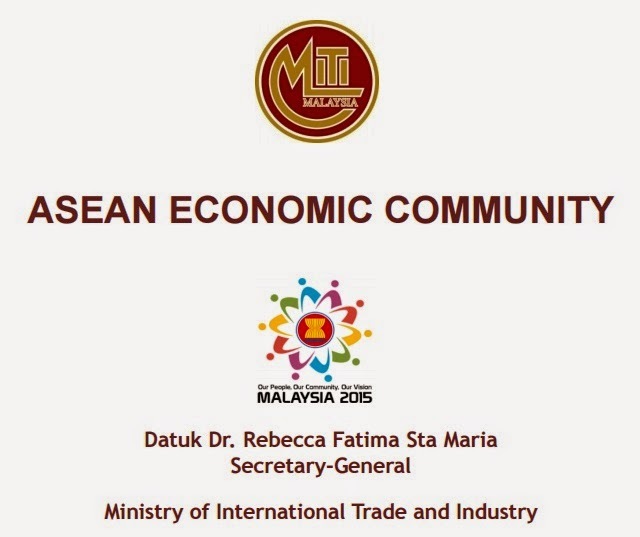 by Tan Sri Dr Mohd Munir Majid, Chairman of the ASEAN Business Advisory Council, and also IDEAS Council Member. It is a technical paper, lots of important data and reflections by an industry player. I am copy-pasting his presentation below. 1. 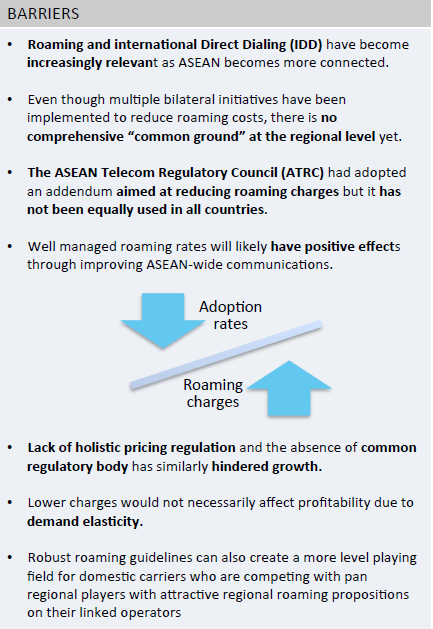 The aviation landscape in ASEAN is changing rapidly, especially with the advent of the low-cost carriers (LCCs). • which now account for more than half of all airline capacity in Indonesia, the Philippines, Malaysia. 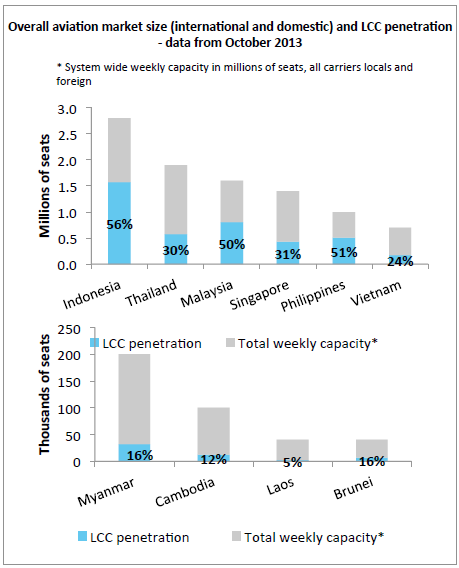 • Total weekly capacity of all carriers in ASEAN is 9.78 million seats. • average LCC penetration rate is 29% and LCCs’ share of capacity is expected to increase more dramatically in the next decade. • In 2009, LCC passenger traffic and aircraft movements at Singapore Changi airport increased 50% over previous year. • Six intra-ASEAN routes are now among the top ten busiest international LCC routes in the world. 2. Infrastructure build up to meet the growing LCC traffic is lacking in ASEAN and airports and terminals dedicated to LCC operations remain the exception. • Many of the main airports in ASEAN capitals have reached saturation point or even exceed their intended capacity, resulting in congestion and delays. • The LCC boom exacerbates the congestion problem, especially since LCCs typically use smaller planes with higher frequency of take-off and landings. • Due to the lacking infrastructure and high congestion there is a problem with the availability of suitable landing and take-off slots, which has forced some airlines to take-off and arrive at unfavourable hours. 3. Human capital – The growth in the aviation sector also puts pressure on the provision on human capital: the Asia-Pacific is estimated to require 185,000 more pilots and 243,500 more maintenance personnel for the next 20 years. A news report last Wednesday, March 18, 2015. I think the ADB President, Takehiko Nakao, is wrong here. OFW remittances are private funds, 100% of it, not PH government or ADB fund. Why would he suggest that remittances "be intermediated for public investments such as infrastructure"? Remittances by Overseas Filipino Workers (OFWs), some $25 B last year, are several times larger, and sevveral times more useful, than foreign aid money, WB + ADB + USAID, etc. combined. Foreign aid is government to government. That is why foreign aid is often tainted with corruption and wastes. Remittances, like trade, is people to people, direct. Thus, its use is more prudent, less wasteful, more productive. When an OFW sends money to repair their old house, or build a new, bigger house, it is "for development" as it creates lots of jobs at the grassroots, at the barangay and municipal levels. Construction workers, hardwares, furniture shops, local foremen and architects, etc. Money is received and used/consumed by the people, direct. No middlemen like bureaucracies that appropriate, disburse, monitor the money. Five economist friends made good comments and reactions. 1. Jun: the very tight (BSP) regulations on banks like adopting of basel 3, stringnet KYC, AMLA, FATCA rules which appear to be motivated by protectionism that our OFWs end up remitting through undercapitalized couriers, Pawnshops and other similar entities instead of safe, well capitalized and more efficient financial institutions in the private sector. 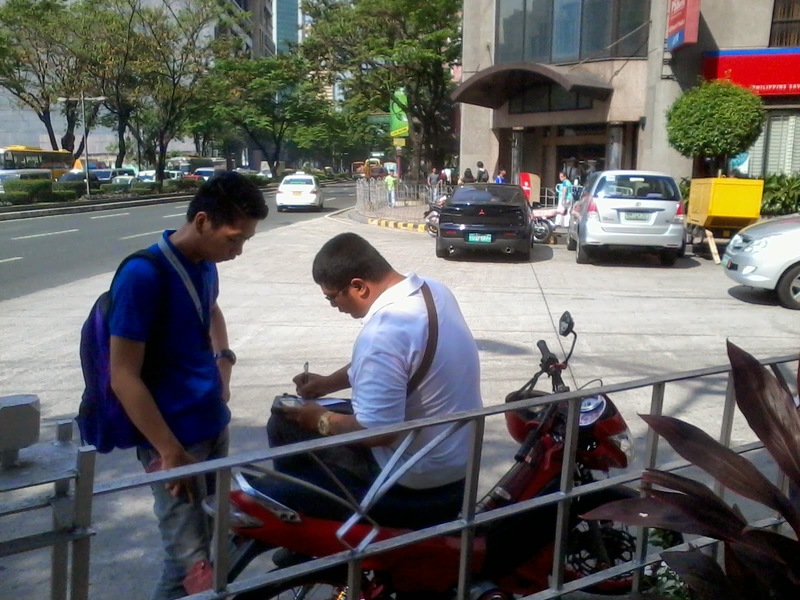 Relatives of OFs claim their money from couriers located in malls end as (mall) spending (instead of saving). 2. Joey: It depends Noy on what is "intermediated" re private funds. If it is designed like PPP where remittances are invested voluntarily, then it is still a private decision and a private fund. The process and outcome how this will come out is debatable. I'm just referring to remittance as private funds. 3. Patrick: A few bitcoin companies are realizing the PH remittance market and started to offer bitcoin remittance. Check rebit.ph, rebittance.ph and coins.ph. Completely bypasses BSP. coins.ph offers bitcoin conversion into cash via ATMs. 4. Adora: hold your horses, Noy. re-read the article. 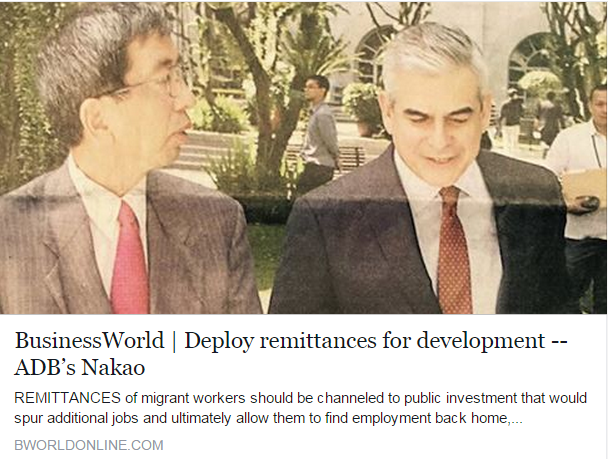 no mention of OFW remittances being treated as public funds. these will remain private. intermediation is to be done through financial inclusion (i.e., developing investment products where OFWs could invest on). it had been tried in the past through diaspora bonds but not many OFWs were able to invest (i.e., not financially inclusive enough) due to low financial literacy, among others. 5. Teresa: Noy, if the remittances are deposited in the financial system, then they can very well be intermediated. Ikaw naman - Econ 121 yan. Money and Banking. (1) It is a valid observation by Jun. More banking and financial regulations by the government (BSP in this case) make the regulated players to pass the cost of additional bureaucracy to the public -- in the form of more papers to fill up, higher bank charges. The less regulated but undercapitalized players like money couriers can act guerilla type and have many outlets, like public markets and malls. So many OFWs send their money to these couriers (LBC, Cebuana, Palawan, Western Union, etc.). The temptation for instant spending is higher if one is inside malls or public markets. And even if we assume that it is a "non-productive" spending, to eat and buy at malls, it is still the households who benefit. It may just be a once a month treat at Jollibee or McDo. (2) On "Spending these "expended" dollars in consumables will be inflationary, but spending in development infra maybe not." may not be true. During barrio or city fiesta for instance, local and micro entrepreneurs anticipate high consumption of pork, chicken, cattle, etc. so they produce these farm products with target harvest period on those 2 or 3-days of fiesta. High household spending fueled by OFW remittances do not create permanent inflationary pressure because local supply of consumables also rise. High supply meets high demand, the price remains at its old equilibrium point. (3) It is another proof that as government regulates more, the cost of regulations and bureaucracies are ultimately passed to the public. So other players sprout to evade regulations while offering more ease, less cost to the public. (4) and (5) There is something wrong if ADB chief thinks that current spending by OFWs and their families are not "for development" and that "remittances should be channeled to funds that would contribute to economic development". a. Most spending by OFWs currently are "for development" already. Like having a new, bigger house, buying a new agri or residential land, or a new tricycle or jeepney, or sending kids to more prestigious schools. b. Most of OFW remittances are channeled to the formal banking system already. "Cash remittances Filipinos coursed through banks grew to $1.814 billion in January from $1.804 billion a year earlier." So what is that something new that the ADB head suggests, at least from that news report? It seems nothing. Now if he suggested that PH income taxes should drastically be cut from 32 percent down to 22 or 12 percent, that is really new. Many Filipino professionals leave partly because their take home pay here is small, only 68 percent is left and from that, various consumption-based taxes and fees are further collected -- VAT, excise tax, property tax, vehicle registration tax, etc. So Mr. Nakao is barking at the wrong tree. If the goal is "more development" for the country and OFWs and their families here, the bigger problem is not with remittances and how they are sent or spent here. The bigger problem are PH government policies, which are partly supported by foreign aid like ADB, like high personal and corporate income taxes, multiple business taxes and permits, from national down to local governments. 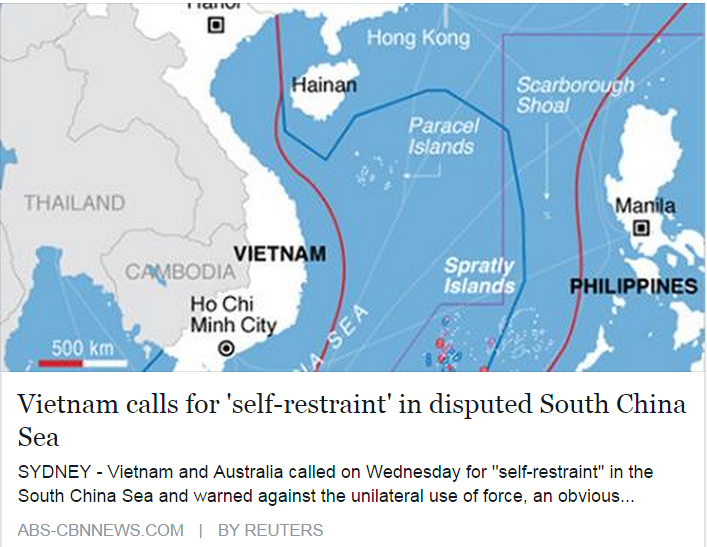 I agree with Sen. Sonny Trillanes that we should fortify our garrisons on the islands we actually hold or control in the West Philippine Sea (sometimes known in China as the smaller South China Sea). However, that will take a lot of money and quite some time before we can build and deploy minimum credible deterrence systems on these same real estate. I commented that I approve of that proposal. More military spending if necessary -- but money should NOT come from additional taxes or additional borrowings. Our public debt stock is rising by about P350-400 bilion a year, with or without a crisis, with or without China territorial issue. Additional money should come from privatization of certain government assets and properties. Like the huge and prime Camp Aguinaldo property in Edsa. (This photo is from Breaking Defense, March 19, 2015. One of Bong's friends commented that a "Purely diplomatic initiatives aka triple approach of the lethargic DFA are hollow and ineffectual." Wrong. China being a communist government bullies everyone that it can. 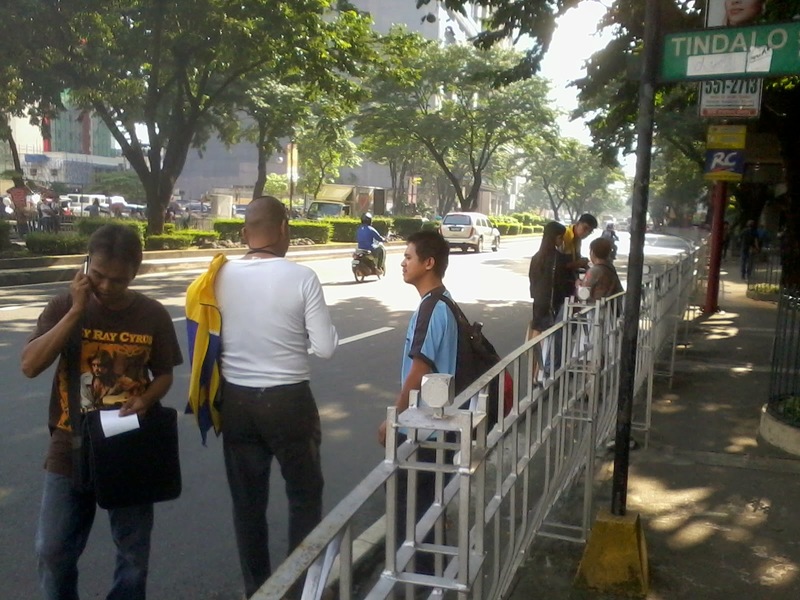 First in line are its own citizens; no freedom of assembly and freedom of expression, no political opposition. Ordinary citizens are even deprived of access to fb, youtube, gmail, etc. 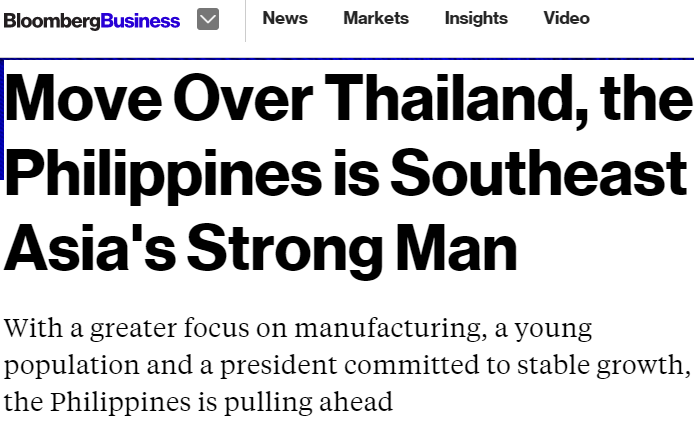 Second, China Communist Party (CCP) bullies its smaller, weaker neighbors like the PH, Vietnam and Malaysia. Third, it bullies its richer neighbors like Japan, S. Korea and Taiwan. China commie government is creating more enemies than friends with its bullying in the territorial disputes. This alone makes that government weak and susceptible diplomatically. At the UN, APEC, ASEAN + 6, other international fora and arena. Continued, endless diplomatic offensive at the international community terrifies bullies and dictators. 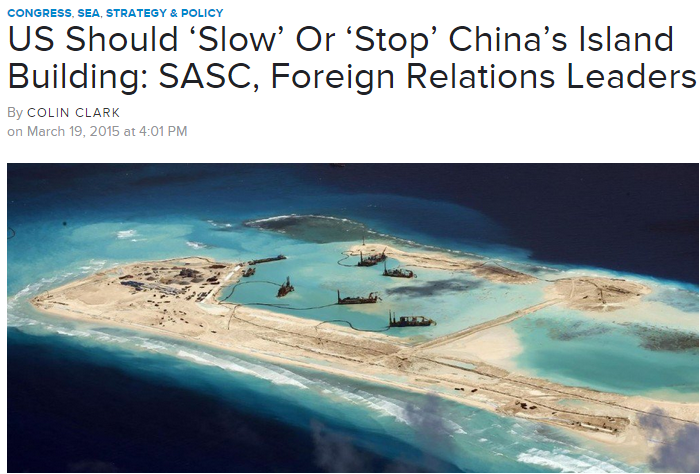 Belligerence at the South China Sea (SCS) or West PH Sea (WPS) shows one faction of the CCP while another faction wants more trade, more investments, more capitalism with its neighbors, not more disputes. The creation of the Asian Infrastructure Investment Bank (AIIB) shows this faction. But the noise of armaments suppliers to the PH government -- they want billions of $ from us, not just a few million $ -- is being echoed in mainstream media. The populism of war mongering is trying to be as noisy and deceptive as possible. Another asked, "Do we have the funds?" The direct, explicit and categorical answer is NO. Even without a crisis, even without buying a single new battleship, the PH government does not have enough money so it is borrowing yearly, around P300 B a year, just to finance various expenditures (salaries and allowances alone + maintenance/MOOE constitutes maybe 80% of the annual budget). Any huge defense spending like "invest more in fighter planes,missiles and effective ships" as Romeo suggested above, would mean annual borrowings of possibly P400+ billion a year. And that means more taxes, more regulatory fees, more fines and penalties, to pay a fast-rising public debt. Large scale privatization of certain government properties, assets, corporations, etc. is the least painful measure for PH taxpayers. But painful for pampered bureaucrats and politicians. PAGCOR privatization would give the government at least P200 B, from a paper I read about two years ago. Huge prime land of the AFP at Camp Aguinaldo alone including the golf course, should fetch tens of billions more. Bong supported my suggestion of more government privatization to raise funds. He even suggested to "sell UP Diliman property and transfer to UP Quezon Province property fronting the Pacific ocean to build a new growth center fronting the Pacific ocean (or at least map out a 20-30 year transfer to UP Quezon plan." 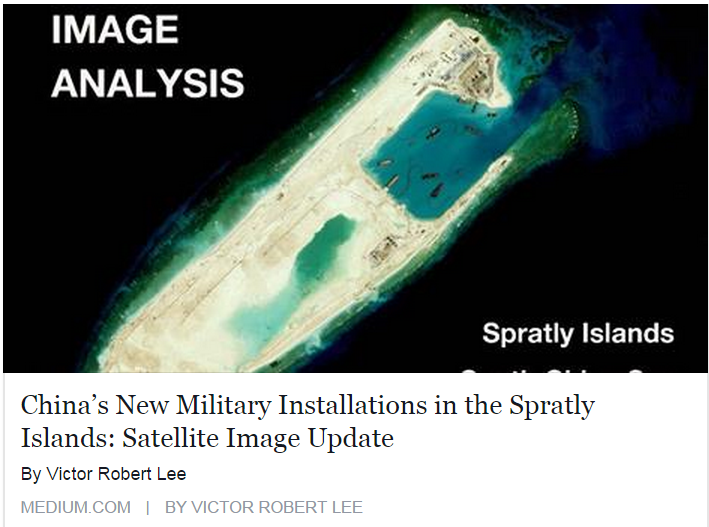 This is a diversion from the issue of territorial dispute with China, but I like this proposal as it is related to privatization and military modernization. A fast train connecting Quezon province with Metro Manila would make UP Quezon Province a very exotic campus to teach, study and reside. Tunnels will definitely be built in some parts of Sierra Madre, the excavated soil and rocks will be used for land reclamation and expand the land area of that province for more ports and real estate development. Such train route and operation won't need public spending, private sector and modern capitalism will be more than happy to finance that, and make good profit in the future. Meanwhile, UP should get tens of billions of money and proudly declare, "Malacanang and Congress, we will NOT be asking money from you for the next 20 years or more. Use that savings for whatever social or military spending you wish." Building tunnels under Sierra Madre mt range I think is relatively easy now with more modern engineering, provided the government won't extort too much from private developers. I remember when MWSS built a tunnel in Sierra Madre to divert portion of waters from (Umiray?) river in Aurora or Gen. Nakar, Quezon (water just go to the ocean) to Angat River. That was more than 10 years ago. My friend who conducted mountaineering training for the tunnel workers said that the tunneling machines were high tech and fast. As they excavate soil and rocks, they also plaster the cleared area with cement and steel. Land reclamation and land banking + train operation, that should be big money for private investors. 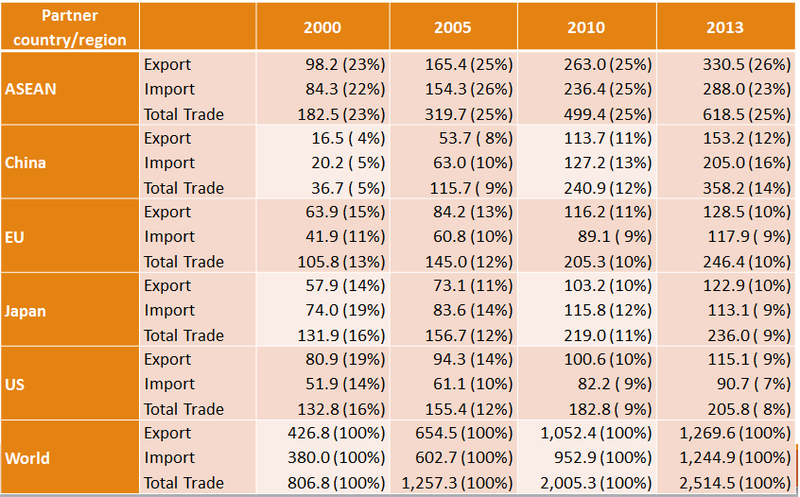 The volume of trade in Quezon as alternative port should significantly raise PH trade with Japan, Korea, US and Canada. Cargo ships won't go around the tip of Luzon and go to Manila bay. They can dock straight at the ports of Quezon. During the Philippine Economic Society (PES) 52nd conference last November 14, 2014, held at Intercon Hotel in Makati City, among the panel sessions was on "Economic Trade Integration." One paper was An Analysis of the Evolving ASEAN-China Trade Linkages presented by Kevin Chua, (Shandong University, China), Ronald U Mendoza and Monica Melchor (Asian Institute of Management, Makati, PH). The authors were asking if China and ASEAN are strategic partners or competitors, because while there is growing bilateral trade between the two, they are also competing in the exports of major goods to similar trade destinations. They reviewed the trade statistics between the two and showed this -- different numbers reported by different official sources. * Hong Kong as trade entrepot: Upon transiting Hong Kong, export goods are added value due to further processing or re-packing. * Recording discrepancy: Chinese goods are recorded as exports to an intermediary country because it is the last known destination by the exporters even if the goods are destined to a third country. * Difference in valuation: Refers to differences in values declared by Chinese customs at time of exportation and values declared to US customs at time of importation. Plausible explanations, so they used the UNCTAD data, chart below. 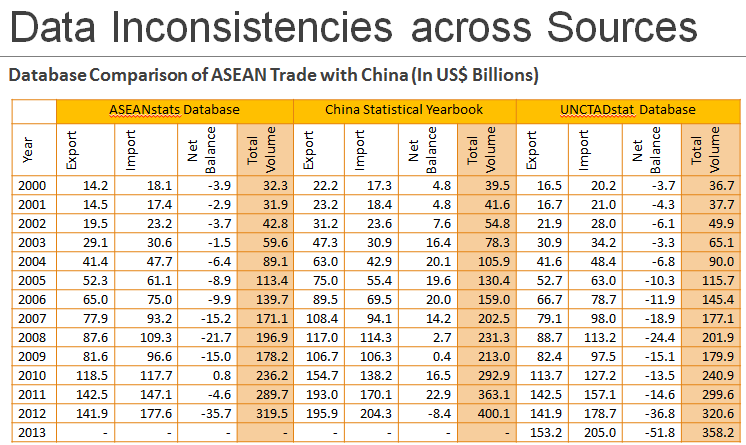 Intra-ASEAN trade slightly increased from 23 to 25 percent of total global trade from 2000 to 2013, The share of Japan declined from 16 to 9 percent, EU declined from 13 to 10 percent, US declined from 16 to 8 percent. But the share of China significantly increased from 5 to 14 percent over the same period. Differences and diversity among ASEAN member economies also led to diverse trade relations with China, and other countries and continents. There is competition of course, between the two. The authors observed that "Comparing the trend of ASEAN’s and China’s share of US, EU and Japanese imports on specific product lines reveals (2000 vs. 2013 figures): (1) Electronic goods (excluding parts and components) and (2) Textile fibres, yarn, fabrics and clothing." Then they showed the RCA between the two. 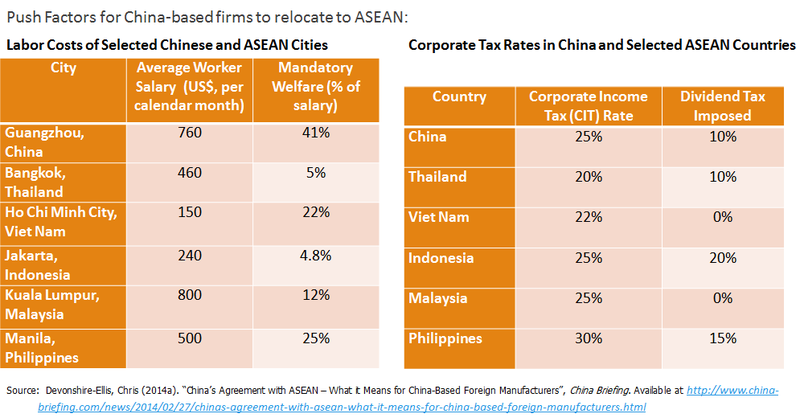 This means that China has higher RCA over ASEAN economies in low-skill and technology-intensive manufacturing, but the latter has higher RCA compared to China in labor- and technology-intensive manufactures. (3) Relatively low cost, (4) Growth in consumption with relatively young population demographics, and (5) Production gap between China and ASEAN likely to decrease as regional infrastructure improves. "1. Diversity among ASEAN economies leads to uneven relations between each country with China. 2. ASEAN as a whole benefits from its relation with China primarily since China offers itself as a huge market for ASEAN products. 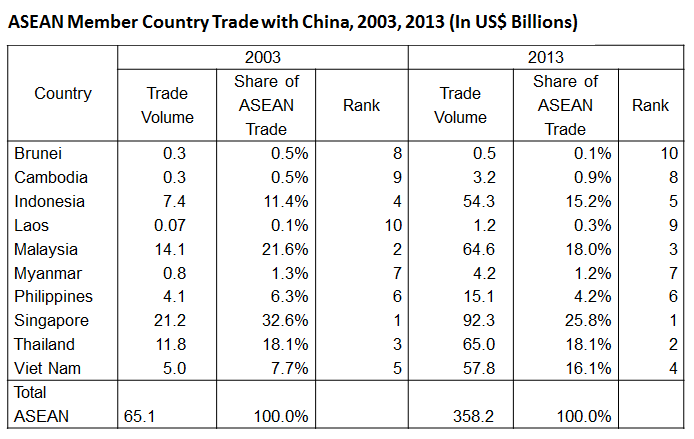 China has become ASEAN’s second largest trading partner. 3. The two regions are becoming more engaged, highlighted by the slow but sure emergence of an integrated regional supply chain. 4. Low-income ASEAN economies are benefitting in the shift of low-value manufacturing industries into their countries. The rest see a threat as China takes over production of high-value manufactures. 5. 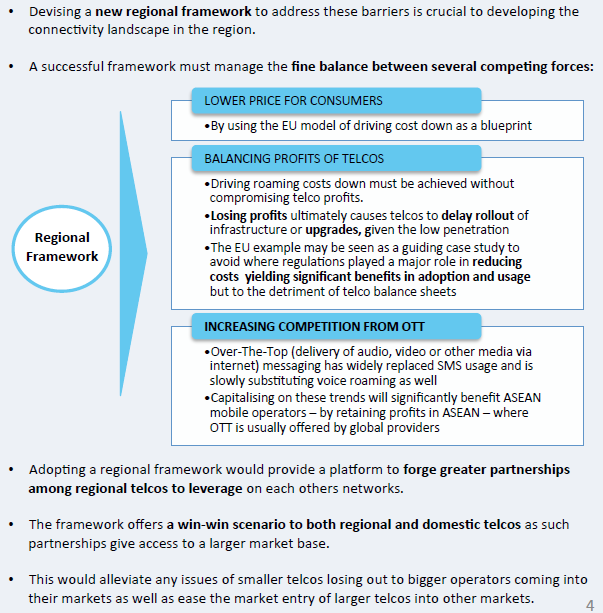 Strengthening the trade in parts and components is a way to improve trade complementarities. 6. Dealing with the realities of an advancing ASEAN-China economic integration means each country enhances its competitive advantages, finds a niche in the regional production chain, and manages the competition with its neighbor." There. 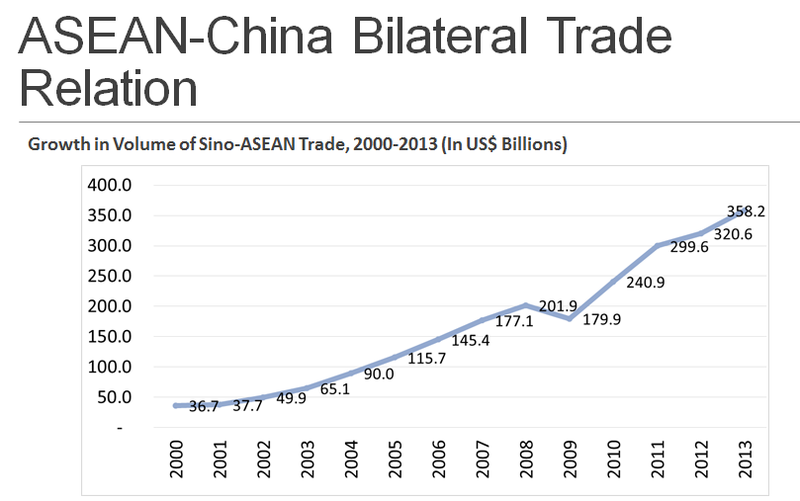 Despite continuing territorial and diplomatic disputes between the two, or at least some ASEAN countries vs China, trade between them is rising fast. Markets and people talk about money and jobs while governments talk about military spending and positioning. And this proves once again that people, not governments, trade with each other. There should be more integration, both competition and complementarity, in trade and investments, tourism and people mobility, between China and ASEAN countries. 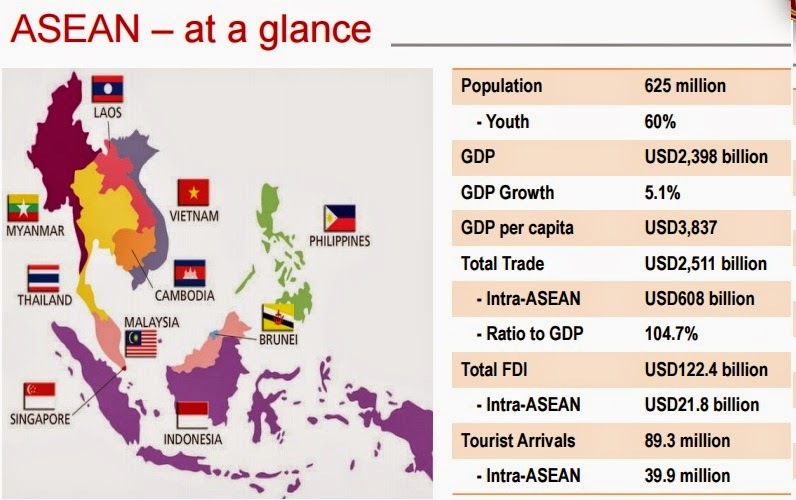 Two days ago, South East Asia Network for Development (SEANET) and the ASEAN People's Forum (APF) held a forum about the ASEAN Economic Community in Kuala Lumpur, Malaysia. 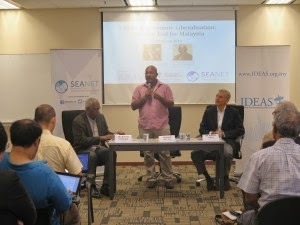 SEANET is a new regional free market think tank based in Kuala Lumpur, and one of the projects of IDEAS. This is one of two papers presented. Ours is a huge region -- in population, GDP size, trade, investments and tourism. Even the 28-nations European Union would be envious of its population size and low or young average age. It is fascinating how a region with a huge discrepancy in wealth among members can have commonality on many issues. Like the agreement to hasten trade liberalization, among themselves and outside the region. Our combined regional population is twice that of the US. Our GDP size, nominal values, is catching up with UK and France. 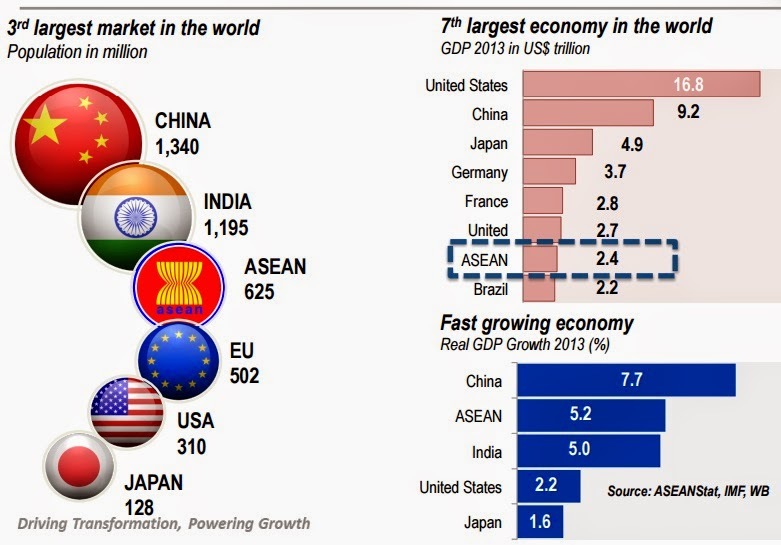 In purchasing power parity (PPP) valuation of GDP, we could be #4 or even #3 largest worldwide. The journey towards economic integration. The community has three pillars: political-security (rules-based norms and values,...), economic community (single market and production base,...), and socio-cultural community (education, health, entrepreneurship,...). 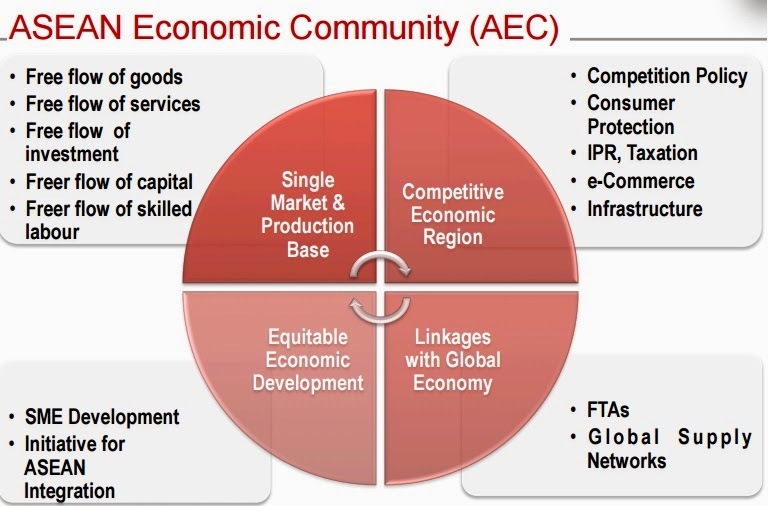 The most important aspects of the AEC for me, are free flow or mobility of goods, services (people) and investments. This is the essence of economic and individual freedom. AEC should constantly aim to make it easier for entrepreneurs, professionals and workers to do business, to hire and be hired.